Everyone loves a good treat. It’s just another thing that we have in common with our furry friends. It’s also a great way to train and discipline your pet with positive reinforcement. The treat aisle is easily just as expansive as the food aisle; maybe even worse, so what kind of treats do you buy? You don’t want to buy something that your cat won’t eat or upset its stomach. Our researched list will provide you something that both you and your cat will feel good about both now and later! Since our cat is part of the family and we want the best for it, many of the top brands responded by offering healthy treats. They’ve also created recipes that are full of nutrients, minerals, and vitamins, while still tasting great. Then there are also some treats that were created specifically to taste great! Thanks for checking back on our posts! We like to make sure our readers can be more informed with newer products for their kitties. Finding the right kind of treats would depend on your cat’s needs. Just because it’s a little over weight or having problems with their teeth, there are treats that will help with these issue while tantalizing your cat’s taste buds. Maybe you have a healthy cat and just want something that taste good. Our list has a little bit of everything and more! Find your cat’s favorite treat here! Temptations surely know how to make a cat treat. Your cat will learn the sound of you opening the bag or begin to recognize your “treat” word and quickly be begging you for some whenever the opportunity arises. These are tasty, help with tartar control, and are at least a semi-nutritious choice. These cat treats pack a very pleasant surprise - they are crunchy on the outside but once you get to the center, it’s nothing but creamy goodness. 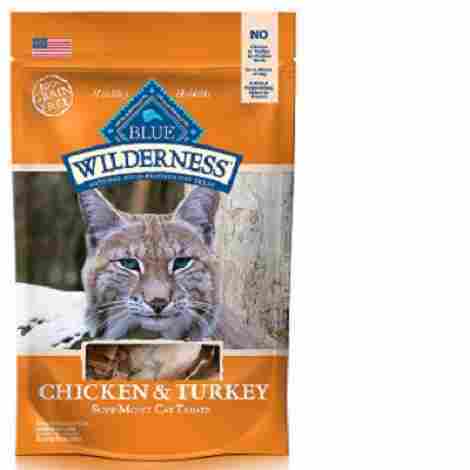 They offer great contrasting flavors and textures that will have your cat begging for more. Do you ever get a package or bag of something but have the hardest time opening it? It shouldn’t be like robbing a bank to get into your cat’s treats. 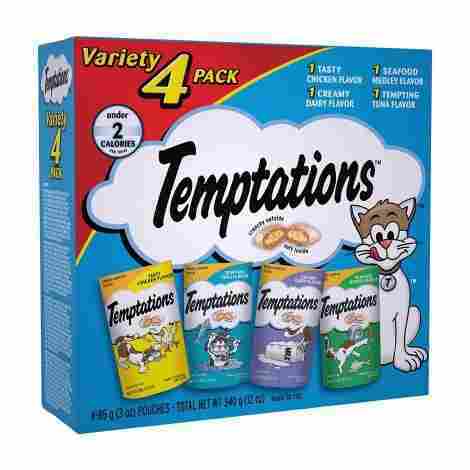 Temptations has addressed this issue and packages their treats in such a way that it is easy to get to them and your cat will be enjoying their delicious flavors sooner rather than later. You’ll like the price of these cat treats just about as much as your cat likes the flavor. They are very inexpensive and can go a long way if you aren’t feeding handfuls to your cat everyday. Your cat will very likely love them which means no waste and furthers their cost effectiveness. A good treat is a treat that feels like a splurge but in reality, really serves a far greater purpose than immediately satisfying your taste buds. These Greenies Feline Dental Cat Treats do just that. Not only are they delicious, but they also help clean your cat’s teeth, are made of all natural ingredients, and are also fortified with vitamins and minerals. Dental health is a major problem with cats. It is a very easy thing to overlook, but just like humans, they get plaque and tartar buildup that can cause real problems if not addressed. The shape, size, and texture of these Greenies will really go a long way in helping improve and maintain your cat’s dental health. Not only do these cat treats clean your cat’s teeth, but they also are super tasty. Your cat will love the flavor and will literally beg you for moe - whether that be for better or for worse I’ll let you decide. It’s a pretty good deal though when you can have a treat that your cat loves that also does the heavy lifting of maintaining dental hygiene. You can get a good amount of treats for not too much money here. 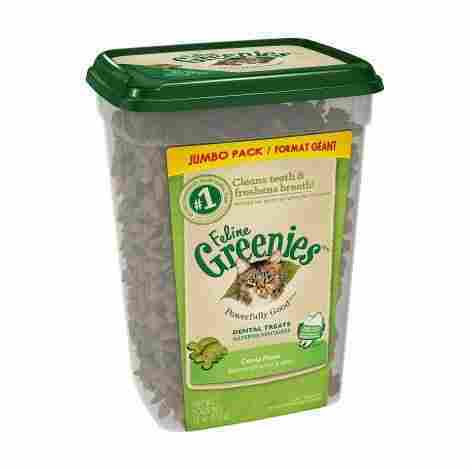 Greenies is a more expensive, premium brand, but as is usually the case, there is a reason that they cost more. They are very effective and fulfill all the promises made on the label. You will be shocked at your cat’s dental health and their love of these treats. These are definitely a quality buy. Do you have a cat who is super particular? Do they only lick the gravy out their wet food and leave the rest or refuse to eat dry food? The good news for you is that HARTZ has addressed this issue by making their food into a sauce. It is simply all blended together into a gravy so that even the pickiest eaters will love it. Your cat will think this treat is the best and lick it all up. It is, after all, simply delicious sauce. But wait - that sauce is not just full of crap. It is fortified with a variety of vitamins, potassium, and even a prebiotic to ensure GI health. It is very easy to open it up and pour it into a dish for your cat. Hint: cut it open along the bottom seam. That way you will get more out of the pack. More for your cat, more for your wallet, less for the garbage. Most treats are very specific in mentioning that you should not give them to kittens - much like you wouldn’t want to feed your baby candy because you only want them to have the best nutrients to help them grow. However; this treat by HARTZ comes in varieties made specifically for kittens, normal adults, and seniors. That ensure that every age group is getting the nutrition they need to thrive. These cat treats are a little bit more expensive that others listed here. However; if you have a picky cat or really want to give them something fancy then these are perfect. You will love the variety that they add and the nutritional content they are good for. Overall, they are a good buy and you will be satisfied with your purchase. These cat treats aim to make your cat happy as well as healthy. They are full of only good, quality ingredients that you are more likely to find in cat food rather than cat treats. Plus, they have all the perks of a treat - your cats love them, they help control tartar, and they have a variety of shapes for entertainment. As cats are naturally carnivores, it only makes sense to feed them food closer to what they would find in the wild and that doesn’t include any grains. Most cats can get away with a little bit of grain and most other treats have grain, but if your cat doesn’t tolerate grains well or if you are doing everything you can to ensure a healthy diet, then these treats are a great solution. 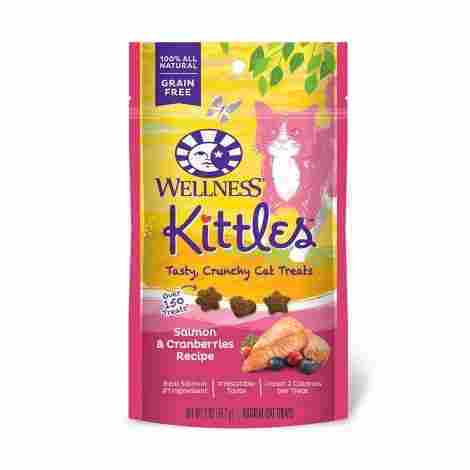 Wellness Kittles takes into account your cat’s urinary health as well as their need to be treated. As cats don’t typically drink enough water, dry foods and treats can really further their dehydration and lead to all sorts of urinary tract issues. This is addressed here with the addition of cranberries and green tea (last ingredient). Both help to clean the urinary tract and encourage more urine output. All things considered, these are relatively inexpensive. While they are perhaps the most similar to actual healthy food than any other treat on this list, they still come with a fairly inexpensive treat price. Your cat will love them and you will feel good feeding them to your cat. That is a win-win situation that will leave you happy with your purchase. 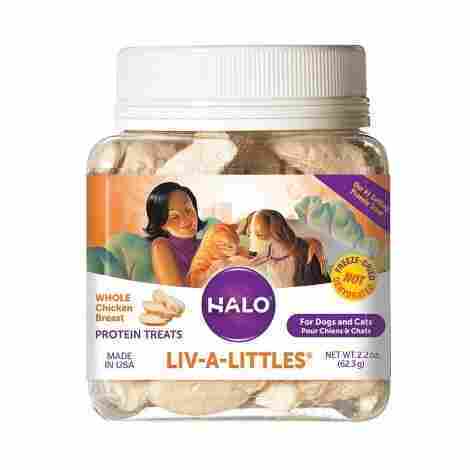 These Halo Liv-A-Littles are another freeze-dried alternative cat treat. They are delicious and will have your cat begging for more or running the second he hears you pulling them out. In fact, many have niche-named them “kitty crack”. They are delicious, healthy, and have minimal ingredients. This is a cat treat you can feel good about feeding your favorite feline friend. These cat treats are healthy and holistic. Because of that, they are very good for your kittie’s digestive system. They proudly advertise that the “proof is in the poop” and it very much is. They are very easily digestible and won’t irritate your cat’s digestive system the way many other treats and even foods do. These treats are freeze-dried which helps to maintain a superior aroma and taste. The process of freeze drying removes the liquid from the raw meat while it’s frozen without causing the protein to shrink or toughen. What is left is a delicious single ingredient treat that has all of its original nutritional content and has a great texture and taste to boot. These treats are expensive. If not the most expensive on our list, they are very close to. However; similarly to the other freeze-dried treats listed here, they are made from pure protein. You are simply taking a piece of meat, freezing it, and cutting it into little bits. That takes more money than adding in fillers and making a treat from there. If you are looking for a healthy, delicious treat that your cat will happily eat without any junk involved then you’ll likely be more than happy to pay the price for these. These cat treats are very different than any others on our list. They are a puree which serves several key purposes. They are nutritionally sound and can serve as a meal replacement in a pinch. They are grain free, have no preservatives or artificial colors and your cat is almost guaranteed to love them. 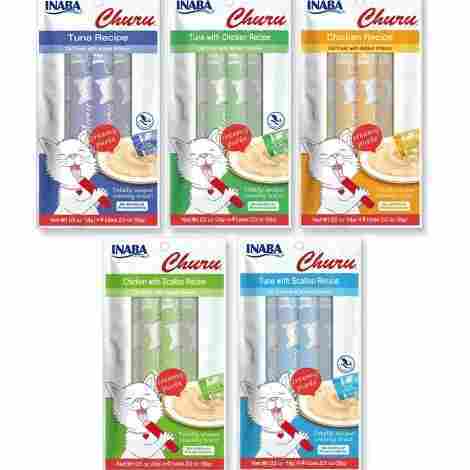 This Inaba Churu Lickable cat treat is served as a puree. This is awesome for a number of reasons. First, it can serve as a source of hydration if your cat needs a little more liquid. 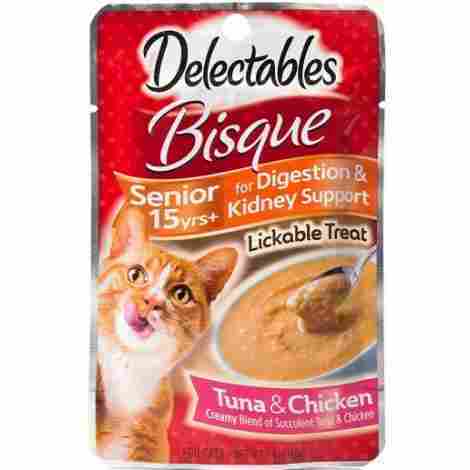 It also works great for older cats or cats with no teeth as there is no chewing involved - they can simply lick it up. It helps to administer medications as well, just crush it up and mix it in. The portable packets that these are served in means that you can have them with you anywhere, anytime. It also makes them super easy to administer. You can simply take the top off and your cat can lick it right from the tube, much like a Gogurt for kids. You also have the option of serving it in a bowl or topping over food. As far as treats go, these cat treats are fairly expensive. However; they do fill a unique need and are well worth their price - especially if it’s something you need to help your cat meet their standard nutritional requirements. This is a unique treat that your cat will love that will have you happy you bought it. Another different style cat treat can be found here, in these PureBites cat treats. They are simply freeze dried chicken. As such, they are pure protein with no artificial ingredients, flavors, or preservatives. This is a great cat treat that you will feel good feeding to your babies on a regular basis - and they will thank you for doing so. 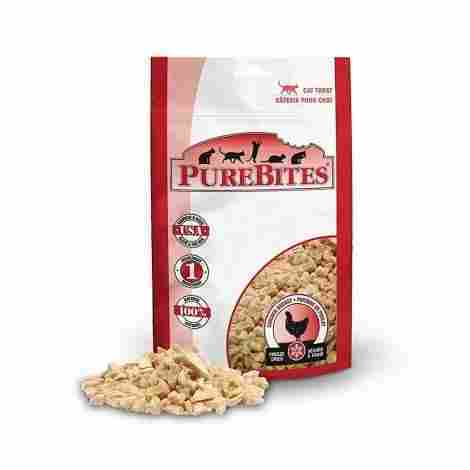 These PureBites cat treats contain only one ingredient - chicken. Even their other flavors are only 1-3 ingredients. You don’t have to worry about any other sort of ingredient that could get in their and upset your kitties tummy. These are healthy, delicious, and protein packed as raw, freeze-dried chicken. Because they are only one ingredient, there is special processing that takes place in order to get them to the right size and in a good condition to eat. That process is freeze drying. Raw chicken breasts are freeze dried which maintains their full nutritional content and the only thing lost in the process is water. These are a little more expensive than the traditional cat treat. That is because they are pure protein - chicken taken right from the source without adding anything else in, or removing anything besides water. That costs more than adding in grains, potatoes, or other fruits or veggies. If you are looking for a healthy treat that you will have no moral issues giving your carnivorous cat, then these are one of the best solutions out there. Blue Buffalo is a company that has a reputation for making premium pet food that is not only tasty, but also good for their health. They have worked with some of the best animal nutritionists and veterinarians to create the top selling natural pet food in the United States. If you want the best for your cat, then choose a treat that they will find delicious and healthy! If you treat your furry friend like part of the family, then you also feed it like one. This treat from Blue Buffalo does not have any artificial flavors or preservatives and contains absolutely no grain. Your cat can tell when real meat is being used, especially if it’s a finicky one. You can feel confident that real trout and chicken was used for the ultimate in quality. This treat cost a little more than others on the list, but it is worth every cent. The company is known for its high-quality food and you can count on something healthy as well! We’ve said it before and will say it again, but the best treats for your cat are ones that serve a greater purpose than just simply treating your cat. 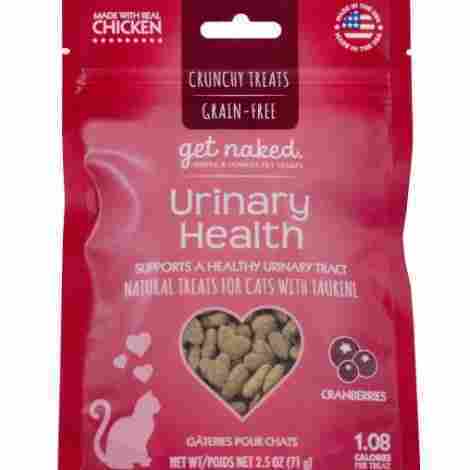 These Get Naked Urinary Health cat treats serve a couple different purposes. The ingredients are reasonable and make a nutritionally sound treat, cats love them, and they are good for both urinary and dental health. An included ingredient here that is not in many other treats is cranberries. Because they are packed with antioxidants, they help to keep the urinary tract clean and functioning as it should. This is especially important if you have a male cat or any cat who is prone to urinary tract infections. These treats are of the crunchy variety. This is great because crunchy treats help to control tartar buildup and maintain your cat’s dental healthy better than a soft treat does. Because of that, they also help with your kittie’s breath which is a win-win situation for both of you. They are also great to add in a little variety both flavor and texture wise. These cat treats fall near the middle of the pack price wise. Not too much, but not inexpensive enough that you seriously question their quality. They do a good job serving as a treat, maintaining your cats urinary and dental health and your cat will enjoy them. There is nothing really extra or fancy than that, but those are both big perks that make them easily worth their price. 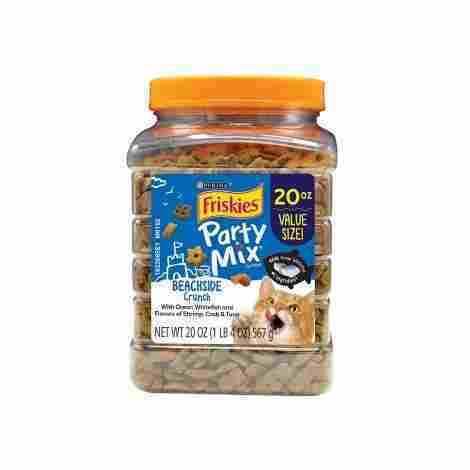 Your cat is sure to love these Purina Friskies Party Mix cat treats, especially if she is a fish lover. With the first ingredient of real whitefish, she’ll also get a decent amount of protein from them. The party mix has various flavors, shapes, and sizes which offers a lot of variety. Since they are crunchy, they also help to keep your cat’s teeth clean. The great news about these cat treats is that they are less than two calories per treat. That means you can give several and not feel like you are giving your cat the treat equivalent of a large slice of cake. While it’s not the healthiest thing out there, it is designed as a treat and as far as tasty treats go, it is decent in moderation. The first ingredient in these cat treats is Real Ocean Whitefish. While most treats are lucky to have a meat byproduct or meal in the first 5, this one prioritizes the meat and makes a whole meat the first ingredient. That is a big win as far as treats go. The price on these cat treats varies a little depending on where you purchase it, but overall it is very reasonably priced. You get a good quantity of treats for a good price and won’t feel like you are breaking the bank in order to treat your kitty. You can even choose which style of packaging you want in order to minimize frustration. Choosing the best treats for your cat is not an easy thing to do. There are many things to take into consideration – from added health benefits to texture, and beyond. Your cat deserves a little extra love and it is just as fun for you to give it to them. Treating your cat also gives you the ability to train them a little and perhaps makes tasks that they don’t love just a little more bearable – enter brushing your cat’s teeth. Cats, like humans, are willing to do a little more if they know there is a reward at the end. As the administrator of these treats, it is your job to make sure that they are treats your cat will both love and that will help keep them healthy – whatever that word means for your cat as it can vary greatly between cats. Rest assured, though, that there are plenty of treat options on this list and beyond that will satisfy your needs whatever they may be. Let’s dive into a few of the things you need to take into consideration before buying your cat some tasty treats. Do you want the treats you buy for your cat to simply be treats? Or, would it be better if they also served a sneaky healthy purpose? There is value to be had in simply a treat – we all love a good indulgence every now and then. But, wouldn’t it be better if our favorite brownie also cleaned our teeth? Or contributed to urinary tract health? That would be pretty awesome too, yes? There are definitely good options as far as making your treat multipurpose goes. The first, and arguably most common, added health benefit is helping with dental health. There are several treats on this list that are specifically formulated to help block tartar and improve breath. You are in a good situation if you can help your cat avoid costly dental procedures all because you are giving him or her a treat that they love and look forward to. Another fairly common added cat treat health benefit is cranberry for urinary health. The addition of cranberry adds a lot of antioxidants which helps to avoid urinary tract infections. Puree or liquid treats can also help improve urinary health by adding in more moisture to help avoid the buildup of urinary crystals because of dehydration. Does your cat have a hairball problem? Don’t worry, there are treats for that as well! Moving cats indoors and taking away a lot of their natural ability to hunt and catch their prey while moving around in the great outdoors means that they are much more prone to getting hairballs and hairballs can cause issues. These issues can and often are addressed in the food you give your cat, but if you want to give them a food that isn’t specifically formulated to also help with their hairball problem, then adding in a treat that will is a good option and one that will make both of your trips to the litter box a little less unpleasant. Another thing of note is the calorie content of the treats you feed your cat. Another side effect of bringing your naturally carnivorous and active cat indoors is that it is very easy for that cat to be lazy and gain weight if you don’t pay special attention. This has dire consequences on your cat and they will be much happier and healthier at a healthy body weight. The good news is that most treats are less than two calories, so relatively guilt-free for the first few at least. All treats should have a recommended dosage on the packaging so pay attention to that, do take note of the calorie content, and be cognizant of how much you are feeding your cat. Even something that is meant to be healthy can be too much if given in excess. Cats are really funny little creatures that have personalities all of their own. They like what they like and it isn’t much you can do about that most of the time. Unfortunately, while adorable and endearing as well as occasionally annoying, this can also mean that you have problems finding a food or treat that your cat likes and will consistently eat. A lot of the problem comes from the texture. Much like many humans, cats care about the texture and feel of their food in their mouth as much as the flavor of their food. You can find cat treats in a variety of textures. Anything from hard and crunchy, to a liquidy gravy. There are textures all in between as well – soft treats, pureed treats. There are even cat treats that have a hard exterior and a soft interior. Really, there is likely a treat that will fit your cats needs no matter what they are. While this is last on our list of things that need to be considered when buying your cat treats, it really is of utmost importance. As a cat owner, you know that cats have more sensitive stomachs than a lot of other pets do and need special attention there. This is even truer if your cat has special health needs. You want to make sure that not only the food you give them is of the highest quality, but that the treats you give them are as well. Like cat food, cat treats span the whole gamut from super healthy to not good for you at all and should only be consumed very sparingly. Unlike with food, treats are treats and you do want to splurge every now and then. You and your cat both need a little treating every once in a while. My recommendations here aren’t going to be as strict as they are on a cat food list, but you do still want to attempt to have the best quality ingredients possible. It is always best to minimize the number of artificial colors and flavors as much as possible. That may be the biggest thing. You should also really strive to have the meat of some sort – even better if it is whole meat – in the first five ingredients. The higher it is on the list, the better. Are you beginning to wonder if this magical sort of treat exists? It does, and they are on this list! There are even treats with simply one ingredient – and that ingredient is real meat – that your cat will be begging you for. Tasty, healthy treats are definitely a reality and aren’t that hard to find if you are looking in the right places. But, what if your cat has special needs? Perhaps they are diabetic? Or allergic to grains? Maybe they are just happier on a grain free diet? There are also many a good low carb or grain free (or both) treat to be had. As long as you are willing to look and read labels you will find the treat that is perfect for whatever nutritional needs your sweet kitty has. Q: Are these grain free? A: Some are, others are not. You can absolutely find delicious treats that are grain free, just be sure to read the label, and more specifically the ingredients. Q: Are these treats soft or hard? A: Generally speaking, if a treat is meant to help with tartar or dental issues it is a hard treat. Other than that, it varies greatly between style and brand. Q: Are these soft enough to chew with no teeth? A: That is debatable based on your cat’s will to chew without teeth. There are excellent options for cats with no teeth, however; check out the purees or liquid treats listed above! Q: How many treats per bag? A: This varies widely based on how big the treat is and how big your bag is. Most will list a ballpark number of treats or servings. Q: How many treats should I feed my cat per day? A: That depends on the treat. Every treat should have a recommended amount to feed your cat based on weight right on the packaging. But, do remember that it is a treat, meant to be given in moderation.